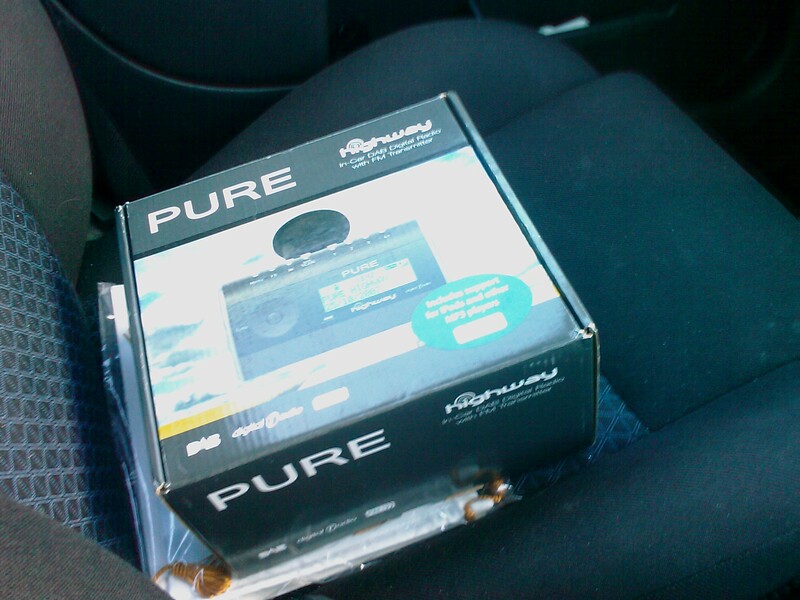 Pure highway in car DAB radio – time to play with my prize! 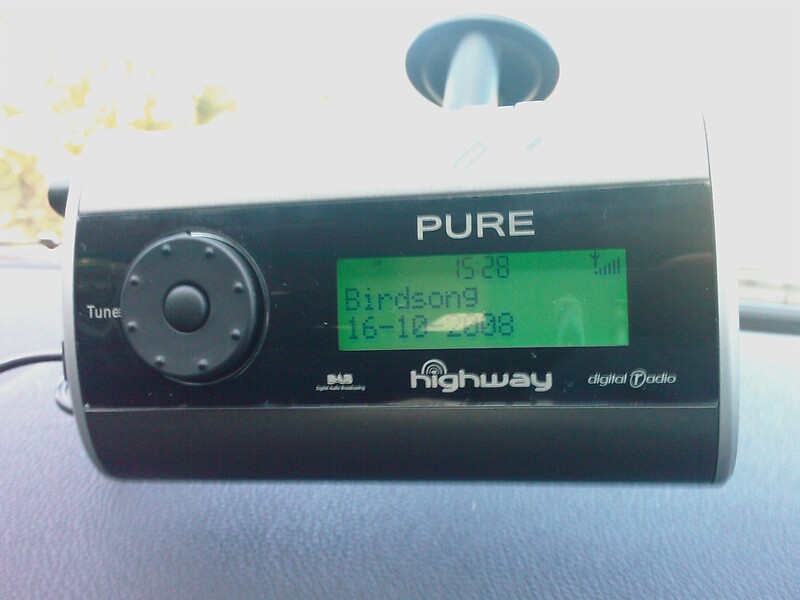 What better thing to be done on a day off than play with the Pure Highway DAB radio that I won. So on a sunny afternoon I took the box into the car and unpacked it like a 6 year old unpacking toys on Christmas day. So here it is in the box, in the car. Ever get the feeling you’re taking too many photos of things not very interesting? Yeah, we’ll move on then. The way it connects to the windscreen holder is clever. It’s a magnet on the holder side. Though quite secure only one thing worries me – putting the holder in my rucksack near my laptop. Hard disks don’t like magnets very much and even though the radio itself is obviously OK I really will have to be careful. I guess the trick is to put the holder under the car seat and only take the laptop and radio with me from the car. 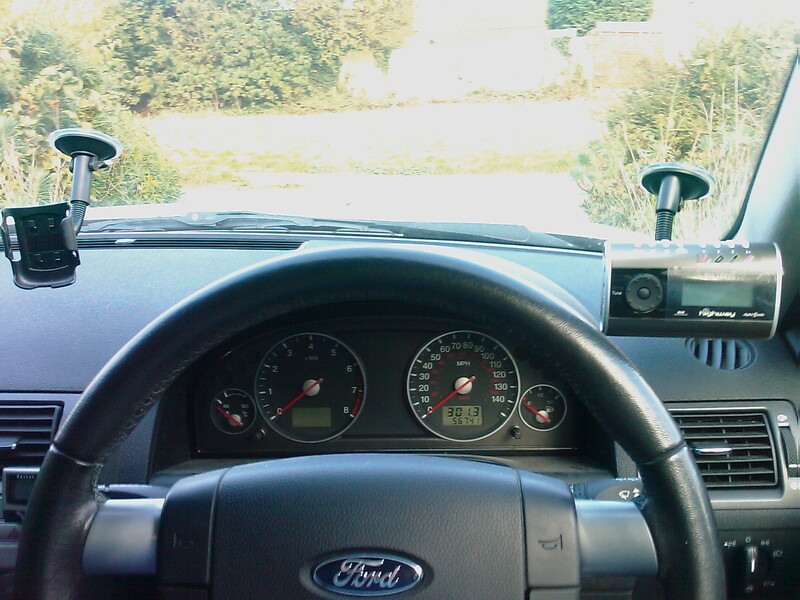 I’m sure leaving the holder on the windscreen is just asking to have a window broken in some areas of the country. The next challenge is where to put it. First i thought to the right side of the steering wheel but it seemed a little big there. Then I thought in the middle which happens to be where my GPS phone lives. It’s OK there but I thought I might be able to find a better position. Both of these positions mean that I’d have to remove the radio every time I left the car in a public place – perhaps there’s a position where I could leave it permanently yet out of site and within easy reach? How about the roof? 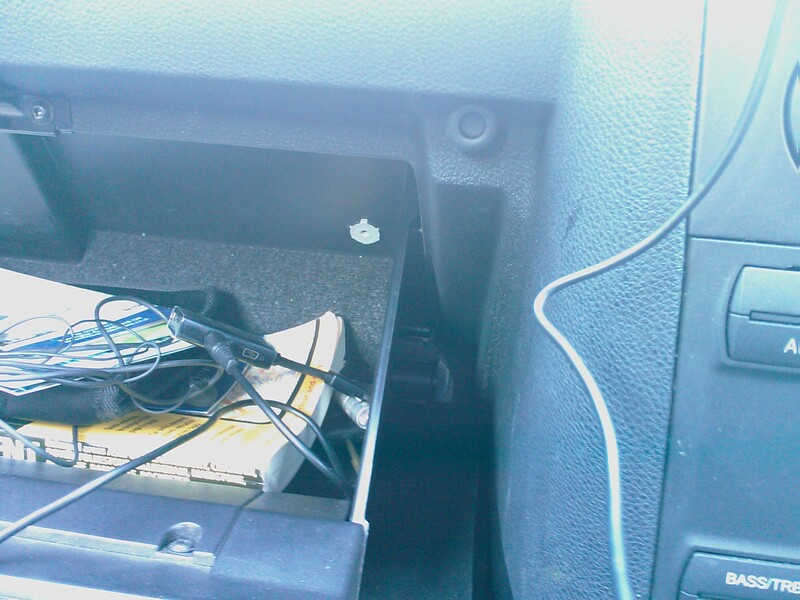 I could live without the sunglasses holder and maybe find an extra long power lead…. Still not happy, maybe I could stick it to the dashboard above the parrot car kit display? Not there either, it would cover the air vents. OK, time to give up for now. Might as well check it works before I decide where to stick it. So, my car has an ‘Aux’ connection in the glove box that looked great when I spotted it but doesn’t actually work very well. I’ve tried connecting a 3.5mm Audio lead to it before from my phone and an iPod. It works sometimes, then sometimes gives audio to one speaker only, then sometimes cuts out completely. The 3.5mm plug fits but perhaps it’s a different size. I did try it again though and the DAB radio played through on the left channel only. 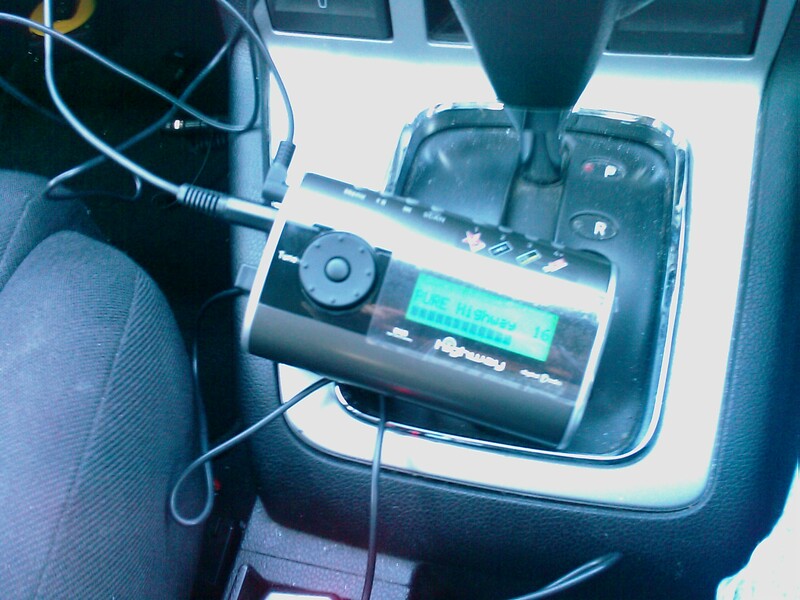 So, the DAB works, time to see if the FM transmitter within it will do the job. On the plus side that means only two wires will need to be connected in use – the Aerial and the Power. The DAB radio may have been already set to use 107.9 as a broadcast channel. I tuned in and it worked first time. The only catch I found was when I turned it off to find 107.9 is the frequency for KMFM, a local station. 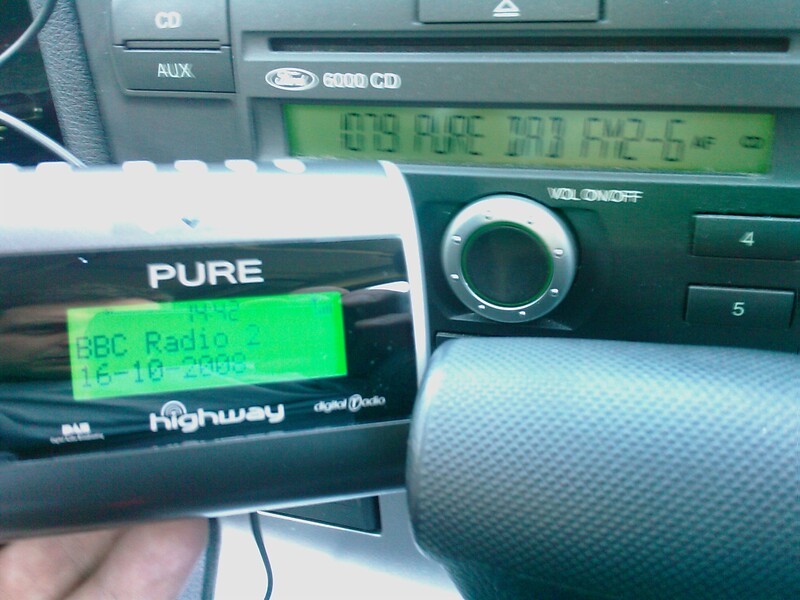 The car radio quite happily reported PURE DAB as the station though and sound was crystal clear. So, back to the challenge of where to put the unit in the car. Maybe I could fix it above the rear view mirror? 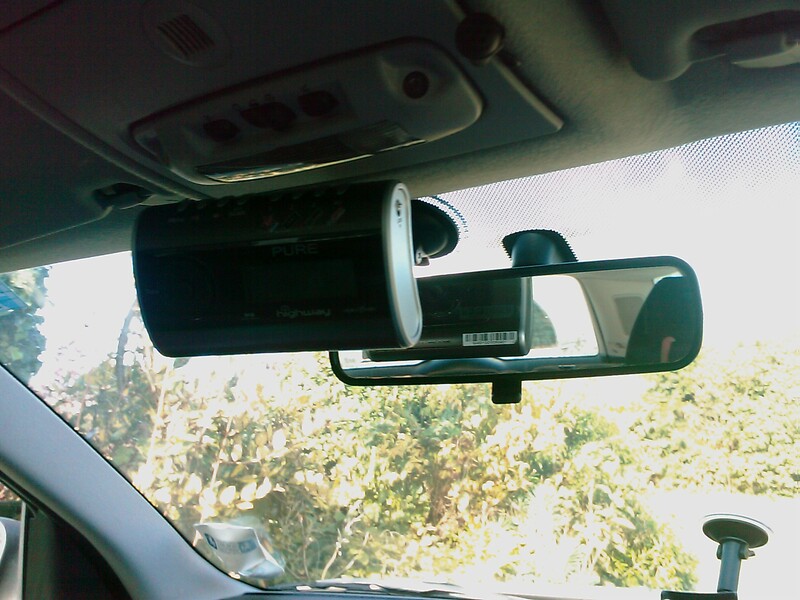 In the end I decided to mount it in the middle of the windscreen. I fixed the aerial to the left side of the windscreen. The instruction book said about 5 cm away from the side of the windscreen so I followed that advice. Usefully the box contained 5 sticky back cable holders so I fixed those to the windscreen to keep the cable under control. 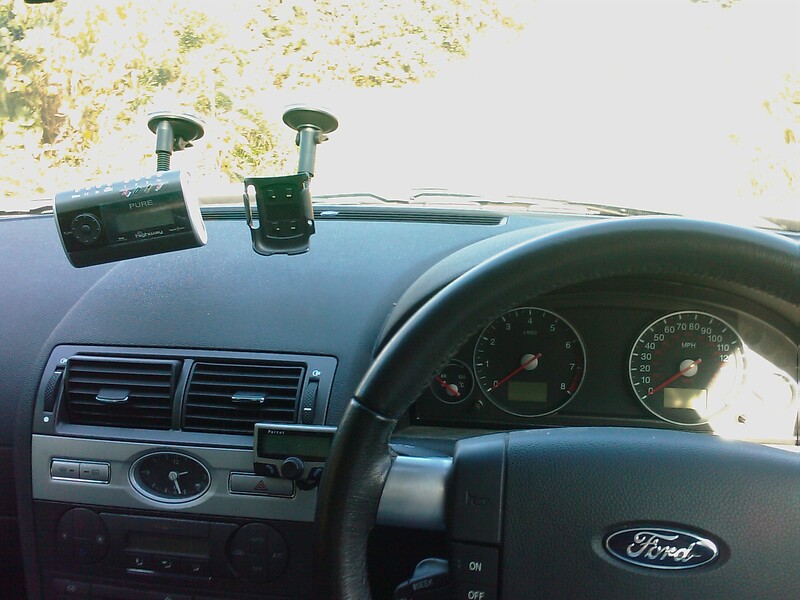 The one thing that I didn’t think so clever was the suggestion that the aerial be hooked to the windscreen mount. 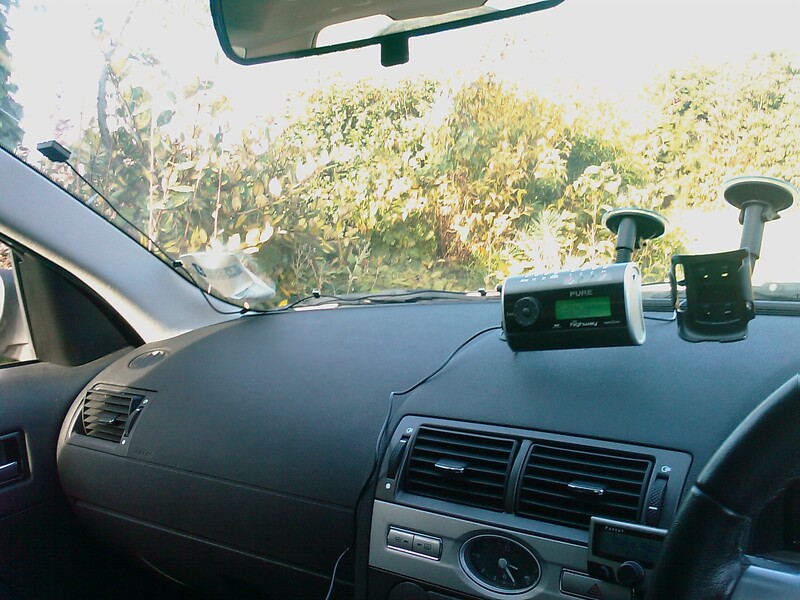 The windscreen mount will need to be removed when the car is left in public (at least, in some of the places I go the presence of a holder could be too tempting to a passing opportunist criminal) so that would mean hooking and unhooking the wire every time. 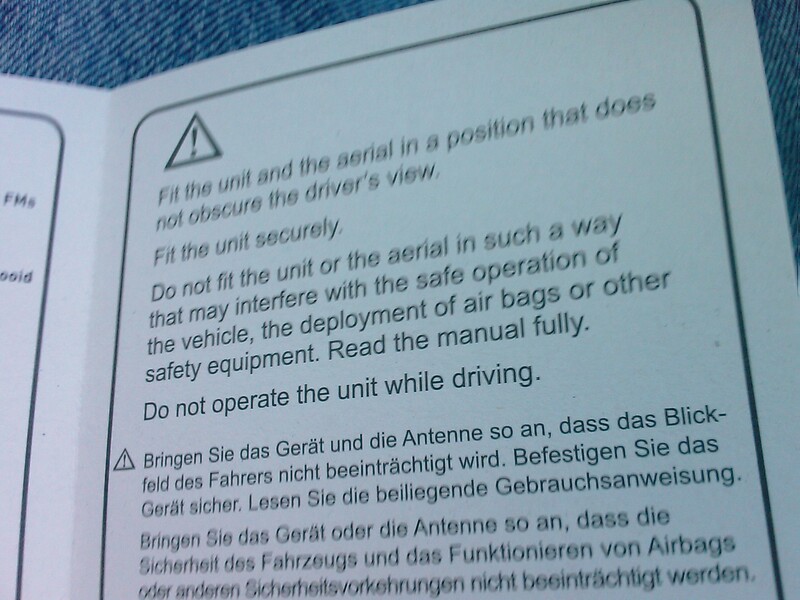 Amongst the instructions was the very useful warning “Do not operate the unit while driving”. Perhaps that was also in the car radio’s instructions. I’m sure they mean – “don’t fiddle with it while driving, set it up then leave it alone and concentrate on the road”. However, the instruction do mention the need to retune the FM broadcast frequency from time to time on long journeys should there be interference from a local station so I can’t see how you could avoid fiddling with it. Finally it’s time to put it to use. I was going to Medway in the evening which is about a 30 minute drive. Radio station wise, I started with birdsong just for fun. It’s a station purely of birdsong, a little heavy on the cuckoo’s perhaps, but probably OK as background sounds. I quickly moved onto Radio 7 and Radio 6, purely because I can’t get them on FM. I settled on Radio 2 which is a bit of shame as I that I could do that using the FM band. At a couple of points on the journey I had to switch to another FM broadcast channel from the DAB unit to avoid interference, although technically I was probably interfering with their broadcast! I wonder how far the unit broadcasts? Maybe any cars passing me had their listening pleasure interupted with my choice of station. I did find the unit wobbled a lot with the cars normal vibrations. The magnet held it on fine but the holder for my GPS phone is rock solid in comparison. Still, if I’m not meant to be operating it whilst driving I guess it doesn’t matter if it wobbles. 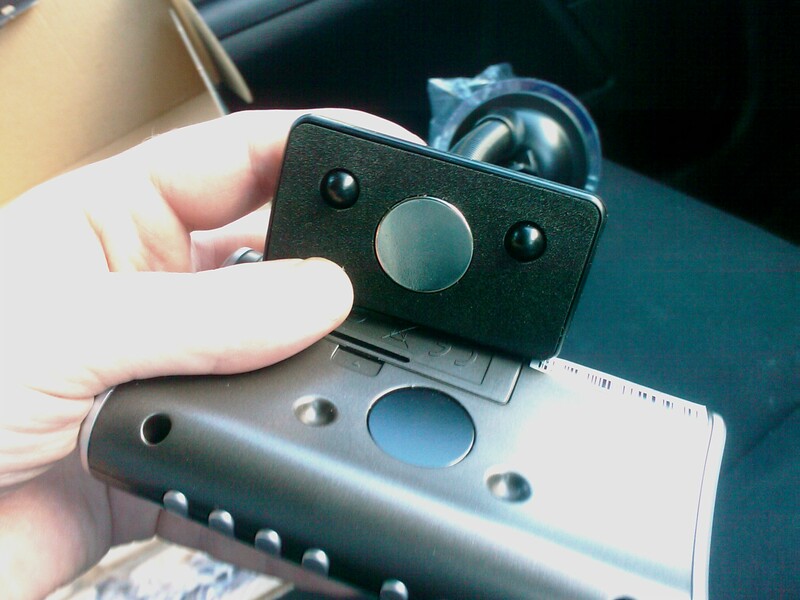 The unit has another plus too in that you can put batteries in it and use it as a portable DAB radio. 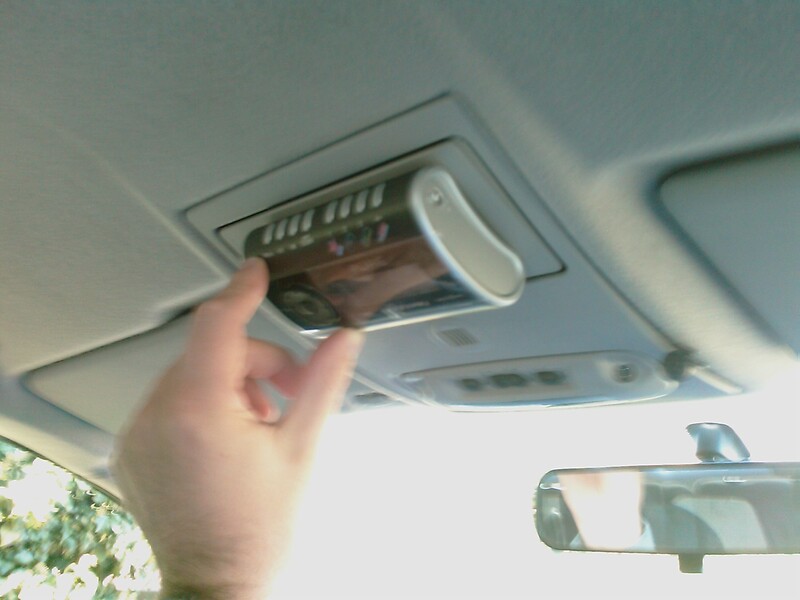 Perhaps it doesn’t need the aerial when it’s outside the car but our home DAB alarm clock get’s nowhere near as many stations as this one does. I guess the ultimate question is “If I didn’t win it, and I had the money and the desire to have more radio channel options in the car on long journeys, would I buy it?”. I’ve just looked at the alternatives because I hate the clutter of more things on the dashboard. 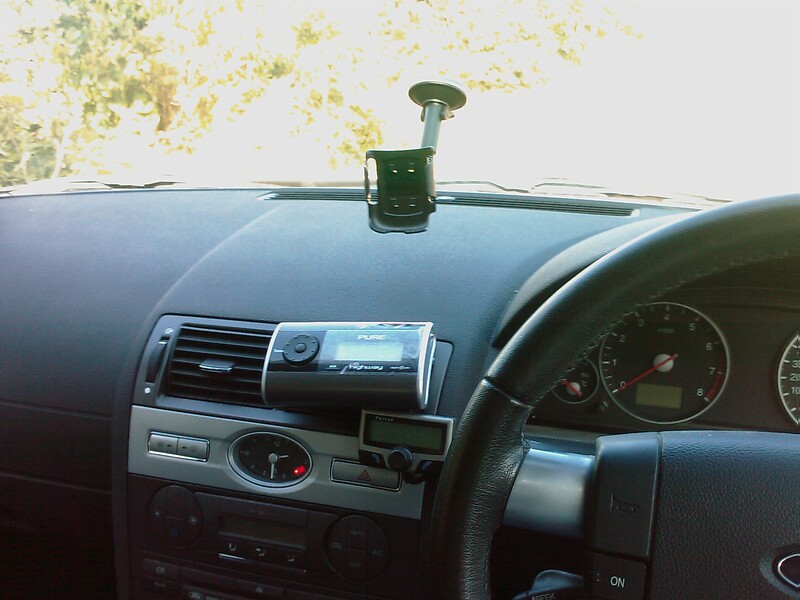 I already hate to have the GPS phone mount and wires trailing to it. The alternative is to get a replacement for the car radio but to have DAB they seem to be in the order of 130 upwards, whereas Amazon are selling the Pure Highway DAB for 55 at the moment. The other thing I read is that a built in unit will need a new car aerial so it’s not something I’d make the effort to fit – so more expense and more parts to buy. I don’t have the worry about buying one then changing car in a couple of years though, we buy cars and keep them for a long time. So, if DAB radio was really important to me I’d buy a built in unit. However, it’s not. For the occasional long journey 55 is better value for money. So, if I didn’t win it and I had the money, yes, I’d buy it. Author srootPosted on October 21, 2008 Categories zzz - None of the Above1 Comment on Pure highway in car DAB radio – time to play with my prize! It must be around 4 years ago I first heard about Chaucer Speakers Club. I remember a man named Jim visited the BNI group I’d set up and gave a very confident and clear presentation. He spoke of his involvement with the Chaucer Speakers Club as a place where anyone can visit to learn ways of improving their presentations. You can deduce how well presented that 60 seconds was as I remembered it until I met Jim again when he joined Rotary at the same time as me in March this year. Last week Jim gave a presentation to our Rotary club on what makes Jim, Jim. He bought with him 3 visitors and those visitors made notes throughout his presentation to give him constructive criticism at a later date. He brought 3 people just to criticise him speaking on a subject he should know well? Yes, and they all came from the speakers club. So, 4 years after meeting Jim I joined him tonight for a Speakers Club meeting. About a dozen of us met in the Kent and Canterbury Club and I must say it was a very refreshing meeting. There were 3 people prepared for long presentations of around 7 minutes. I say prepared, two were prepared in advance and with specific goals of achievement, for example, one had to present a topic with humour. However, one person had the unenviable task of presenting for 7 minutes on a topic she was to be told just 10 minutes in advance. After these three had spoken, another three members gave a critique of each presentation. Stating the goals, highlighting good and bad within each part, the critique was like a presentation in it’s own right. Then a short interval and some 2 or 3 minute presentations on a topic given on the spur of the moment. Geoff (who is also a Rotarian with Jim and I) acted as compare nimbly starting a theme of music then responding to details within each presentation to create the next topic. For me (he had asked me if I wanted to speak on a topic before hand, and despite the fact I force myself to do it so often I still have a fear of presenting things) he said in his booming orators voice, “I recently discovered that the Whitstable Players are having trouble recruiting songsters,… Steve, ..tell us why you haven’t yet joined.”. I thought I made quite a good start. Everyone else had a formal introduction..”Mr Topic Chairman, Speakers, …” and on they went. I figured that I already had an introduction with Geoff’s question and beside I had no idea what title’s were being used so having stood, I looked at some of my audience and went straight in with “Perhaps the reason I haven’t joined the Whitstable Players that I’d never heard of them until now. Now I know about them they’ll have to join a long line of things waiting for me to do. Jim invited me to the Chaucer speakers club some 6 years ago…..”. No one knew the 6 years was an on the spot over estimate and Jim never corrected them (though I guess my impression on him at that meeting was far less than his impression on me!). I continued into describing my first presentation, which was really a Christmas reading in front of the High Sherif of Kent and how, as I read that for the first time, my knees shook so much I could feel both sides of each trouser leg and how I had begged to do the reading again they year after so I could do it better. I said how I have to work on something until I truly understand it and that I couldn’t join the players until I have some other things completed. I finished with a sentence something along the lines of “On the subject of presentations, I still have to learn to speak slower.”. And then sat down to polite applause. After everyone had spoken on a topic, a member gave a review of each presentation. I was quite correct that I speak to fast – it’s a known flaw that I’ve been working on for years. At the end of the meeting another member gave a critique on the meeting as a whole. Picking up things both good and bad with the way the chair had run the meeting, how the critique of the 3 minute topics took 13 minutes when the member knows the goal is to critique in 7 minutes. Analysis was on the verge of over analysis yet at the same time was full of gems, not just “That was poor”, “That was poor because….. try…..instead”. Really useful things to have as feedback. Things in a lot of company people just wont tell you for fear of offending. It was so refreshing to see the whole meeting honestly review itself in different ways. Some very accomplished speakers were plying their trade. They knew they were good but they were seeking out ways of being better. No skill in life is easy and this club is like a training ground for speakers as a football player will practice penalty shots. At the end I got more feedback from Suzie who reviewed all the mini topics. In addition to speed, when pushed she identified a limited vocal range. Going so fast also gave me little time to make full use of gestures. This nugget in itself might help me slow down – ensuring a gesture is put to full and good effect. I also found out that of my 2 minute target time (they gave the new boy a smaller target) I spoke for exactly 1 minute and 48 seconds. Not bad! Especially as I didn’t look at their traffic light timing system as no one had explained it to me. It would have been too much to think of anyway. All in all this was a great meeting to have been to. Everyone supportive, a real fellowship of self improvement at work. Oh, I haven’t mentioned the several hundred page binder they have which sets the challenges and the skills to work on. Turning the art of presenting into a science of subtle but definitive objects. On reflection, I’m still scared of speaking in public, but I’m better at speaking than kicking a football – The difference is just where I’ve been training myself. We all have nicknames. Some we know of, some we don’t. Some we find fun, some we don’t. A friend just emailed me on a Rotary topic using “Rootlebaumeisterstuck”. I have no idea how that came to be made up! Within the club I’m often named Rooty simply because there are 4 members called Steve.